Four things contribute most to the formality of an outfit: shine, darkness, contrast and desaturation. We see all four of them in formal outfits such as black tie. Dark black or midnight blue is contrasted against stark white. There is virtually no colour – perhaps just a dash in the handkerchief or boutonniere – and there is shine in the grosgrain silk, the shine of the shoes. Navy is the more common starting point for formality in a lounge suit. When considering what to wear for our Tailoring Symposium last month, therefore, navy was the first thing on my mind. It was a hot night in Florence, and a double-breasted jacket would be more formal than single. So my navy hopsack double-breasted jacket, from Elia Caliendo, fitted the bill. Next, the trousers. Grey would have been the formal default (plain, lack of colour, enough contrast with jacket and shoes). But I was keen to try my silk/linen brown trousers from Panta Clothing. They are very light and the silk gives them a slight sheen, which suggests a touch of formality. I’d consider how to get enough contrast with the shoes (see recent post on Caraceni) later. For shirt, tie and handkerchief, the default formal option would always be a white shirt, plain dark tie, and white hank. This achieves the desired elements of darkness, contrast and desaturation. This is why wearing a white shirt in the evening is, for some men, a useful rule of thumb; it usually makes any outfit more formal. But the top half would have been dull if it was just plain navy and white. It might also have looked detached from the trousers. So I substituted the shirt for a pale grey. That retained the lack of colour, sacrificed a little of the contrast, and injected a touch of personality. In looking at the top half, above, note how much more formal the bright-white handkerchief and silk navy tie make it. A silk with more texture (eg grenadine), or with less shine (eg wool or linen) would have been much less formal. Equally a handkerchief that provided less unbroken contrast. The shoes are brown-suede Belgian loafers from Rubinacci. I know some people dislike the sockless look, but I like it and my God it’s cool. They also created just enough contrast between shoes and trousers, due to the textures of suede vs silk/linen, and the black bow and piping on the shoes. Also good here would have been the suede and velvet slippers Gaziano & Girling are producing at the moment (from £380). They have soles and heels that are a touch thicker than normal cemented shoes, making them much more practical than other slippers (including, I admit, these Rubi ones). Tie from Drake’s, shirt from Luca Avitabile. For those in New York, Luca and Luigi Solito will be there in September – the 16th to the 18th, at HMS International Fabrics (730 5th Ave, suite 502). Contact info@lucavitabile.it and sartoriasolitonapoli@gmail.com. You can follow the discussion on A hot, formal evening in Florence by entering your email address in the box below. You will then receive an email every time a new comment is added. These will also contain a link to a page where you can stop the alerts, and remove all of your related data from the site. Lovely outfit, but please stop tying your ties in the Italian fashion!! On the tie-tying, I think the reason I like it is that I have always been most interested in the crossover between sartorial dress and more modern, casual dress. When no one else is wearing a suit in the office, how do you dress better without looking like you’ve stumbled into the wrong building? How do you add elements of elegance without appearing too formal? How can you dress smartly yet always be appropriate to the occasion (and considerate to your host, therefore)? This is the area that – in my experience – modern men struggle with most. Not how to wear a suit, shirt and tie to the office every day. But how to sit somewhere between that and a T-shirt and jeans. I really like the idea of such an article. It is something I am constantly thinking about. I find if you try to dress well you automatically look more formal to the uninitiated, so you need to tone down the formality by playing with the textures, fabrics and styles. I wear a lot of more casual fabrics, to not feel out of place on the office. Linen shirts, fresco suits, knitted, shantung or tussah ties, brown shoes etc etc. is it a Four-In-Hand-Knot? How did you “tie” it? Looks very nice to me, but i believe it has something of an Ascot-Tie which is making it appear more formal than a “normal” Tie-Knot. So, pretty more suitable for formal event. I am planning to do so on Saturday. A normal four in hand, yes. Just tie it normally then pull the two blades apart, one to each side. Great outfit and I love the lapels. 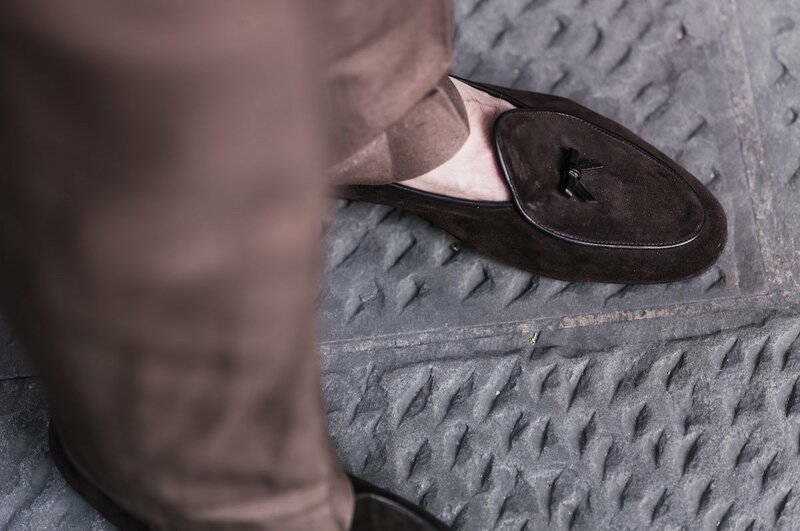 However, could you tell us about the quality of the loafers from Rubinacci? A local store are selling them now, and I was just wondering if they are really worth the price. They seem really delicate and because of that they don’t look really durable. However, are they any brands you would recommend me checking out? They won’t be that durable if worn outside all the time, no. I only do so rarely. They would be fine if worn inside though. I would suggest the Gaziano & Girling slip-ons I mention in the piece as a good alternative. Great combination. Brownish trousers are a little risky, because too brown = too dull, isn’t it? But then the sheen evokes grey and contrast in a subtle way. Your words on the crossover between sartorial and modern might deserve an article (or a series…) on it’s own. You have mentioned it before. In a way things have already become so much dressed down to an extent that when someone dresses formally it can look very stunning. As you have demonstrated once in a while, e.g. with pictures of cutter Michael Browne. I really like the outfit (though the loose fitting of the trousers is not my style). One of my favourites you have shown. Now I am hesitating of going to Naples to have made a blazer like yours at Elia Caliendo or at Solito. There is a difference in style? The finishing is better at Elia, I imagine. Nice ensemble and I love the jacket. However, you state that double breasted is more formal than single breasted (autocorrect is trying to change that to breastfed, hehe). I was under the impression that traditionally double breasted was considered more casual, or do you think that this has changed over time? There have certainly been variations – and we can see them today in black tie, for instance, where a DB is still considered to be less formal than SB. First time I read this and found the article quite abstract e.g. “Desaturation” (I think it’s the philosophical P from your PPE degree coming to the fore!). But a very good topic nevertheless rather like some recent ones around colour coordination and assembling a look for the day. I think your response to Ivor is an article in itself . How does one look smart without feeling out of place and somehow guilty !? If I wear a suit to work I’m questioned about my state of mind and intention by colleagues . P.S. Personally I love the tie . The phrase ‘dumbing down’ refers to lowering standards in TV or culture, etc, in order to appeal to more people. If we lower our standards of formal dress, we only become part of the problem. Many people want to dress up but they lack the confidence to stand apart from the pack. I believe in dressing up or down only as the occasion itself requires. The slobbish, shapeless, cheaply-made garbage that many people wear nowadays will have no influence on how I dress. I refuse to give an inch to those people. Why? Because when you’re right, you’re right. I haven’t got time to explain why to the rest of them. Well, then I’d dress informally but not scruffily. I don’t do flip flops and t-shirts. I’m not going to wear a dinner suit to a barbecue! Maybe I’d wear chinos with a nice shirt or l/weight knit and suede shoes. Informal, but not scruffy. God forbid! Ive just been on the G&G website looking for the slippers at £380 that you talk of and cant see them…? Swelled edge again! Well done. I like the coat but not the way the lapels sit open. Another fine combo – little to quibble over here. However, i still don’t like the no-socks MO. If one dons a tie, a DB and a trouser containing silk, i imagine you already decided to put style above comfort so you might as well wear some damn socks. Case in point: i was telling my wife and her friends about how i prefer textured ties: wool/cashmere, linen and especially silk-knits. And how the silk knits in particular are different, playful, fun etc, she proceeded to laugh, and she told me deadpan ‘It is a nice tie but ties are not considered fun or playful’. Ipso facto, you might as well go the full hog as the average Joe on the street would not really care about your knots or your tie arrangement. Would your wife’s friends react the same way to both my Caraceni outfit, and recent tobacco/cream one? I do fully accept that there is varying levels of formality in ties, that clearly a knit tie doesnt look as formal as a satin silk model, however these are small degrees of separation and I really struggle to ever consider a tie “casual”. Unfortunately this is part of my problem, I have seen many and bought a few great looking shantung and wool knit ties but just never have an opportunity to wear them. They are too informal for business and dont go too well in my eyes with smooth worsted suits but there are no events I go to out of work, particularly daytime, where anyone at all is wearing a tie. I’m already in a minority wearing a jacket even if I am pairing it with jeans or chinos. The tie can be one way of smartening up an outfit, just like a jacket or a polished pair of shoes, but you don’t have to wear them together. Smashing combos – the second one in particular and they would of course like it. Maybe i wasn’t articulate enough, she does endorse and like my style. The salient point is it’d still be considered formal to Joe Bloggs on the street. Heck, some of my friends have difficulty distinguishing between an odd jacket and a suit. In fact, i am convinced that suits /ties one day will be like wedding dresses for many: worn on your wedding day, and then kept in your closet forever for posterity. History would suggest that, but we shall struggle against it! As soon as they invent something with better material than wool, in a cut that flatters you more than a tailored suit and has more pockets in more useful places to carry your junk – I’ll be first in the queue to buy it! Absolutely superb jacket – looks amazing. Have you done a separate post on this yet? What’s up with those trousers thought? They look really wide and ill-fitting (especially from below the knee). I agree with the comments on the tie – there is sprezza and then there is over affected – unfortunately this falls into the latter. Yes on the jacket – it’s linked to in the post. The trousers are a little wider than normal, but the fit is fine. It’s impossible to assess on an image like this, and rather creased due to the linen/silk make-up. As a demonstration – the trouser legs are exactly the same length, yet look very different due to one leg being forward and my weight being on the back one. I quite like these trousers, Simon. They’re a bit different to what you usually wear. I think the wider leg suits the temperature and the more stiff drape of the silk/linen cloth. I see these as a less formal trouser but I like the unexpected aspect to the trousers being worn in this way (dressed up). I certainly don’t like a bare ankle with a tie, but then you’re not exactly wearing a suit. It messes with my head a bit (conflicting formal/informal messages) but I do like the outfit! Great outfit Simon! 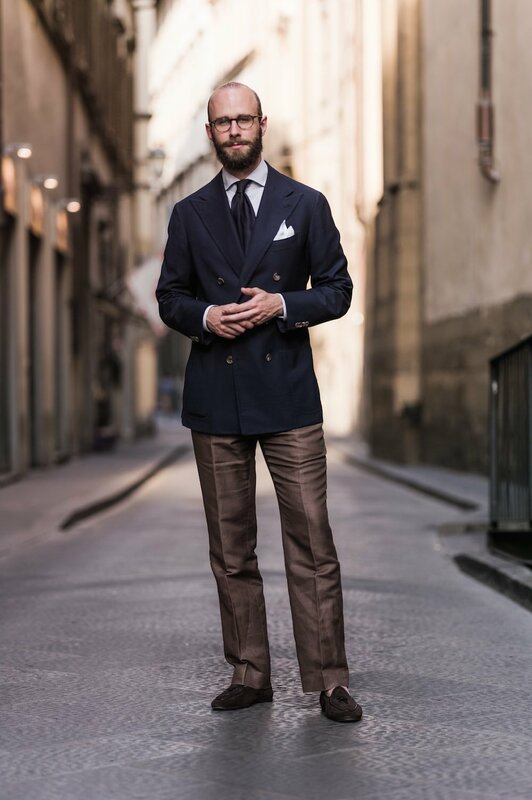 Navy jacket with brown trousers is an underused colour combo but works really well here – I think the textures you’ve used are key to pulling them together. Sorry Simon but I think this outfit is, for you, a very rare faux pas. The top half is fine but the trousers just don’t work. The contrast in cloths is just completely wrong. In my opinion, a linen suit in the correct weight works because the two parts bed in for a louche look. Alternatively linen trousers can work with a seersucker jacket or with a traditional blazer but in this instance it looks like you’ve paired a more formal jacket with trousers that are too casual. Finally, you appear to be currently very fond of your browns and tobacco colours. I can understand this because when it works, it works well. In this instance I’m afraid it just doesn’t. One other question (sorry for all the posts – on a long, boring flight!) would you ever wear a double breasted suit without a tie? No problem, always interested to hear your questions. No, I would never wear a DB suit without a tie. I would rarely wear a suit at all without a tie. If you do, however, be aware of the lack and attempt to fill it somehow – so put some more interest around the neckline, perhaps with a crewneck sweater, and wear a handkerchief if you can. As in all things, be aware of why that rule exists (wearing a tie with a suit) and break it intelligently. What is the material/weave of the shirt? In a hot weather I am sweating with just the shirt on:). Do you sweat in this outfit? This is a plain poplin, but for hot weather I do recommend linen/cotton mixes. A little transparent at times, but always fine under a jacket. And better than 100% linen which can be a little stiff and uncomfortable. This is a very chic outfit! Your notion of desaturation deserves a post, I’m afraid! Wow, interesting to see the controversy this outfit has generated in the comments section… Getting like the DailyMail here! As I saw the outfit in person, thought I’d add my tuppence worth: short version I thought it looked great. As always, context is everything which the more conservative commenters may be a bit unaware of. 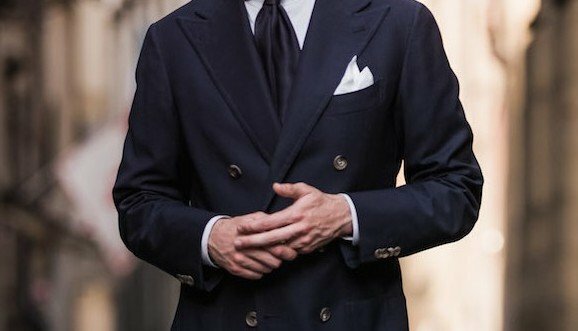 This was shot at Pitti Uomo – and there is absolutely no point going to Pitti Uomo wearing a standard navy two piece suit with a notch lapel and a matching navy tie, as lovely as that can be when done right. You’d just look boring amidst all the dandies. So you gotta raise your game as the saying goes. Pitti is a time to let lose on your sartorial wishes / darkest desires and gauge the reaction. One of my tailors described it as playing in the dressing-up box and I have to say I think he is right. But no, this is probably not an outfit you’d wear to the office in a conservative business environment – however I don’t think it was advocated as such? Of course, any time you break a rule and start to get subjective in your interpretations, some will love it – others, not so much. Others still will clutch their pearls and need smelling salts to be revived. Sorry to pull you back to this post, Simon. Frankly, I find it really instructive in many respects. Even your comments – starting with your first reply – as well as many made by your readers are full of cues! Unexpectedly enough, I have, for instance, eventually realized that the after-6PM-black-shoes rule can be easely broken without any sense of guilt. And believe me, it’s kind of sartorial liberation! Dear Simon. A quick question from Norway: what do you mean by “desaturation”? Tried to look it up in a dictionary, but no such luck. All above the waist is very fine, particularly the coat. However the trousers are truly dreadful and look like a pair of (very creased) pyjamas. Frankly, what would be the point then to have silk / linien trousers, obviously to be worn in hot weather? I thought J’s comment above were enough to settle this matter once and for all. I can’t help but wonder what kind of trousers you may be wearing or considering stylish regardless of environment, social or natural. Are you sure you don’t need to overhaul them? Such a simple step might help you save a lot of money and above all smarten up your wardrobe. My dear chap, I have always believed that silk is best for ties and pyjamas-not trousers. I can assure you that my wardrobe requires no overhaul and consists of only the very best and finest sartorial items from Europe’s leading tailors and suppliers and includes a collection of outstanding handmade alligator bags and accessories from my very own brand Bianca Mosca! No socks! Et tu, Brute? P.S. Ignore Tim; seems nice, but dim. I intuitively think that the outfit—which is of course amazing as is—can benefit from 1) a heavier shoe and perhaps a trimmer leg opening and 2) a slightly shorter jacket. Both are for reasons of balance, though in different aspects of the outfit. Why have you chosen the proportions that you have? 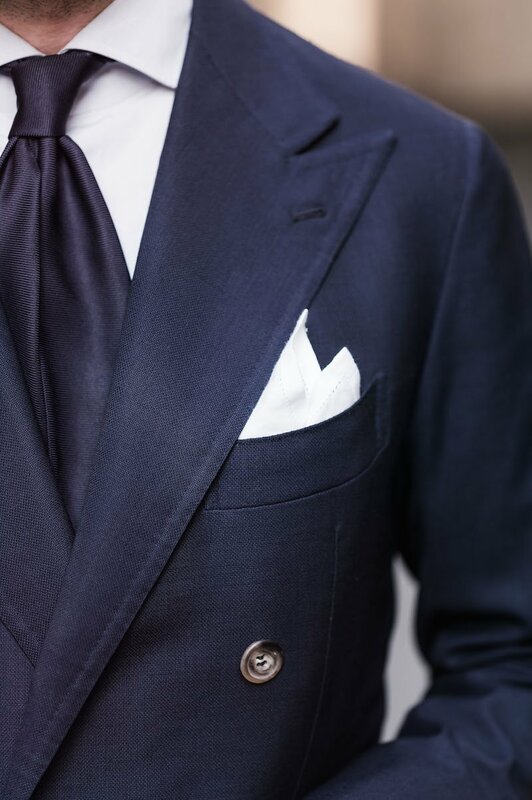 I wouldn’t have the jacket shorter, it’s already fairly short for a classic bespoke piece. Needs to cover the seat etc. I’m late to the party, but I was curious (and maybe I’m just missing the whole point here), but why not a dark suit for a formal evening, perhaps in fresco for a hot, formal evening? Or was the goal to show that odd trousers and sport coat can be used for formal events as well? I see. This post actually came in handy for me – I have an upcoming hot (Texas) formal evening (concert) and my suit recently ripped. I only have one suit, since my profession does not call for suits. As it’s a two button, notch lapel charcoal, it has filled in wonderfully on formal occasions, night outs, and the occasional professional event that calls for a suit. In the time between replacing, which takes consideration given my budget and hard to fit size, this post was very helpful to me. Not a bad combo. The sockless loafer look is too far left field from the rest of the wardrobe. Quality tan laceups would have been a better choice. This outfit looks wonderful. I reside in the Hamptons and NYC and my look is interchangeable with this. Blue and brown are great, often have fuller cut trousers and don’t see the negative comments about baggy making sense. Having some linen and silk in the trousers gives them charecter and very summer look. Hot weather and no socks…………….makes sense and looks appropriate. Simon this post made me wonder — what’s your view on tan/khaki trousers (so not brown, and with a wool/linen fabric without the silk’s luster) with a navy blazer in the evening? Appropriate, or only advisable during the day? Simon, I am thinking of having a blazer made for summer wear, warmer months south and west in the U.S. Would be using it for business meetings with mid grey pants (sometimes with a tie) classic Italian background look, but also with chino’s and jeans. Often combining, travelling for business in more formal towns with less formal environments like LA. Any advice on the type of construction, material and color please. Simon, thank you for the thoughts much appreciated as ever.